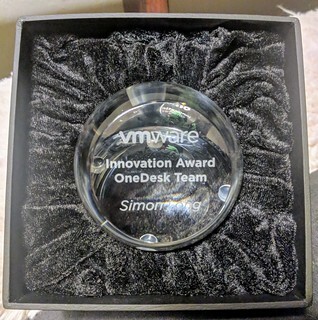 I thought I would share some pretty exciting news with you guys, I’ve recently received an award internally within VMware for a cool project that myself and my colleague Aresh Sarkari have been working on for the past 6-8 months. The project in question is called OneDesk. I’ll explain more about OneDesk shortly. 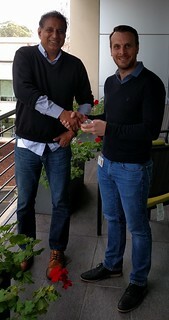 The team which best accomplished the goal of creating and developing new products and/or services. Luckily for me, our CIO, Bask Iyer was kind enough to present the award in person. It’s always a great feeling to get recognized for hard work. I’m very glad that other people within VMware also see the value of the project we’ve been working on. The project myself and Aresh have been working on is called OneDesk. For those of you who attended our VMworld session: The Secret Sauce Behind VMware’s Internal Horizon Desktop Deployments you’d have heard us talking about it during our session. For those of you who were unfortunate enough to miss it, I’ll explain all about it now. OneDesk is an End User Computing (EUC) environment created from un-used production hardware where we deploy pre-release versions of our EUC software (Horizon, App Volumes and User Environment Manager). This allows us to test our products before we make them publicly available to our customers and providing feedback to the product teams of any issues that we encounter throughout or testing. OneDesk also acts a Pre-Production environment for VMware’s internal Production Horizon desktop environments in the US, EMEA and India. The availability of our production Horizon deployments is extremely important to the business and often updating software can lead to service outages. By deploying the newly released EUC software into OneDesk as early as possible, we can use our experiences to make decisions on when we will upgrade the production environments. OneDesk also acts a ‘Next-Generation’ environment for our production Horizon desktop environments in the US, EMEA and India. The availability of our production Horizon deployments is extremely important to the business and often introducing new products or configuration changes can lead to service outages. We will be deploying all new products and configurations into OneDesk first, allowing us to iron out any creases and monitor stability before we consider deploying these changes into the production environments. Last but not least, this is a VMware on VMware initiative. Where there is a business need, we look to utilize as many of VMware’s products as possible. By utilizing our own products early in the development cycle we are able to identify bugs and offer feedback to our product teams to help improve our customer’s experience once the products are released. How is OneDesk different from the VMware production Horizon desktop environments? The table below gives you an idea of how the services differ. Not only does deploying early releases of software allow us to test some really cool new features that we’ve been able to implement into Production, this also allows us to capture many bugs before we release the products to our customers. Hopefully, this means that you, our customers, have a must most stable product that you can rely on. 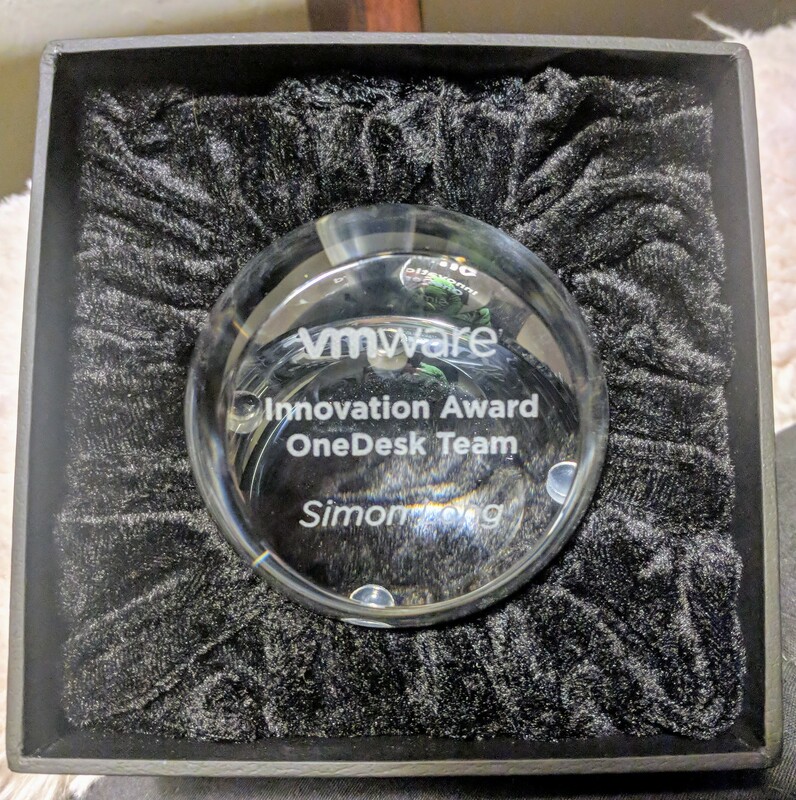 I’ve really enjoyed designing and deploying OneDesk and watching its value to VMware grow as we utilize it more and more. I’m looking forward to seeing where we can take OneDesk in the future. Watch this space.